New Construction (under constr.) Custom Built! Views! Awesome floor plan on acre + corner lot, dual access. Concrete paver driveway. Spacious 4 BR w/ 4.5 BA. Every bedroom has a bathroom! Gourmet Kit. w/ lg island & walk in pantry. Expansive great rm opens to massive outdoor covered patio(42x15). Bonus rm for office. Master retreat w/ walk in closet. Tons of storage rms, closets & linens. 3 car gar (33x27) w/ 2 lg doors. Still time to pick out your finishes. Extra pad for granny flat, pool or workshop. Not remodeled - transformed! This was to be the owner's forever home & it shows: gorgeous kitchen, beautiful hardwood floors, paid-for solar, newer dual pane windows, newer HVAC, new electric panel, water-friendly landscaping w/drought-friendly drip system & insulated back patio cover for outdoor entertaining. Rooms are over-sized, even master bath is spacious (14 x 11 with a nearly 60 sq. ft. shower!). Media room is so movie celebratory, there should be a red carpet! Lovely landscaping front and back. Architecturally interesting manufactured home on just over an acre, perched high on a hill with extraordinary golf course, valley and mountain views, surrounded by native Oak and Manzanita trees. This private 3 spacious Bed, 3 full bath home offers a stucco exterior, numerous dual pane windows, sliders & clerestory windows that bring in an abundance of light. Large eat-in kitchen with island and plenty of cabinets & counter space. Large living room with corner fireplace, large dining area, upgraded baths, laminate flooring, interior laundry room & attached oversized two car garage! Private master ensuite with secondary bedrooms at opposite end of home for maximum privacy. Spacious covered patio perfect for barbecue get togethers & offering exceptional sunset views. Equipped with a seasonal stream and a mansion for your chickens — what more can you ask for? Located in the quaint neighborhood of Los Tules, adjacent to the Warner Springs Ranch Resort, it is just steps to the Resort’s 18-hole golf course and grill! Area amenities include hiking and horseback riding along the Pacific Crest and California Riding & Hiking Trails, Glider flights & wine tasting along the North Mountain Wine Trail. Ideally situated for day trips to San Diego, Ramona, Julian, Borrego Springs, Palomar Mountain & Temecula! VERY LOW HOA! 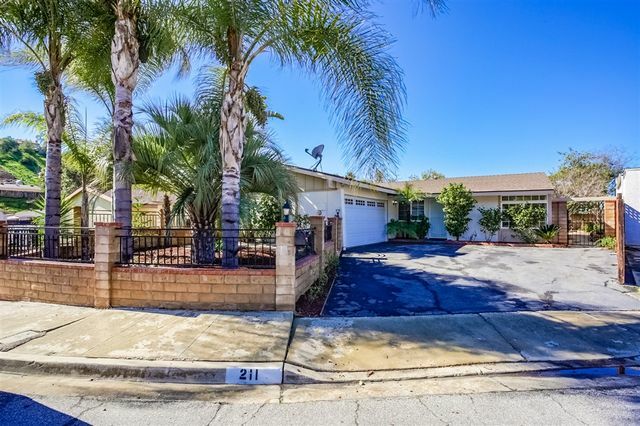 Excellent location near Santee recreation, shopping and schools. This home offers wonderful amenities including two pools, playgrounds, a detached 1 car garage & in-unit laundry! Move-in ready with fresh paint, new carpet & flooring. The spacious master bedroom even features a walk-in closet. Enjoy your own outdoor space on the generously sized balcony. Amazing opportunity to own in Riderwood Gardens. 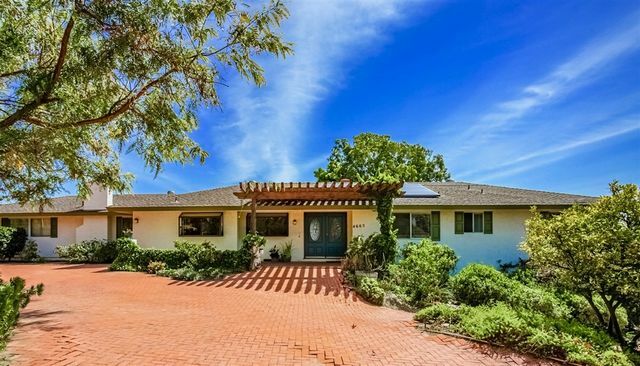 Seller will entertain offers between $799,900 - $849,900. 39 ACRE MULTI RECREATIONAL ESTATE AWAITING YOUR ENJOYMENT! Bordered on 3 sides by BLM and Cleveland National Forest, Bucksnort Ranch lends itself to numerous outdoor recreational activities including horseback riding, hiking, hunting, motorbiking, falconry, team building & more! Multiple trail access connecting to the Pacific Crest & California Riding & Hiking Trails. Have a green thumb? Grow your own fruits/vegetables or try your hand at viticulture! This Custom home features 3363 sf, 4BD/3BA, huge upstairs bonus room & spectacular views from every room! Granite counters, beautifully detailed tile flooring, tall ceilings, cozy fireplace, beautiful woodwork & zoned radiant heating are some of the well planned details. Gourmet kitchen featuring Viking Range, pot filler, SS cabinet depth French door refrigerator, built-in microwave, 2 drawer dishwasher & informal dining area! Private Master ensuite with huge walk-in closet & master bath featuring his/hers vanities, shower, jetted tub & fireplace! Bucksnort is equipped with an arena, 4 & 10 stall mare motels, hay barn & RV parking with hook ups - perfect for your guests or possible rental income! Private Playground, Corporate Retreat, Airbnb, Exclusive Get-away — the possibilities are endless! Minutes to local area wineries and to Warner Springs Ranch Resort with 18-hole golf course and restaurant. A quick 30 minute drive to Temecula for major shopping, and medical. Come and experience all that Bucksnort has to offer! This VACANT LAND is larger than the average lot, in this unique manufactured home, retirement community of Stone Ridge at Warner Springs Estates. Located on an edge of the community, the space overlooks the beauty of natural habitat and oak trees, and is convenient to the community's entrance and mail box cluster. Being approx 60' wide, this lot will accommodate a very comfortabe floor plan of 1,600 sq.ft. with space for a 2-car garage along it's side. Plan an appealing front yard, with space at the rear for a private deck, or ground level patio. There is plenty of space on this lot to work-up your dream. In the back-country of San Diego County, enjoy smog-free & star filled skies, 4 seasons, exciting wild life, hiking, golf, and wine country. Socialize with planned activities in the Clubhouse, as well as private parties, dancing, swimming, and fishing in-community. Explore nearby towns of Borrego Springs, and Julian, and the Palomar Observatory. Only 30 minutes to charming Temecula for major shopping, medical facilities, theaters, restaurants, and antiquing. A DELIGHTFUL CHOICE FOR RETIREMENT LIFE.